Accepta 1025 is a high quality concentrated sodium hydroxide (caustic soda) solution available at 25% for use in the treatment of boiler feedwaters. 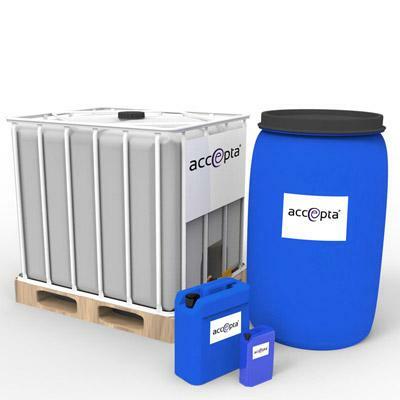 Accepta 1025 can also be used to regenerate anionic resins in deionisation plants. It can also be used for most neutralisation processes where the pH must be raised. Accepta 1025 is ideal for providing caustic alkalinity. High quality concentrated caustic soda solution. Ideal for most neutralisation processes where the pH must be raised. Regenerate anionic resins in deionisation plants. Dose Accepta 1025 to give caustic alkalinity levels in the boiler that comply with B.S. 2486 : 1997. Dose Accepta 1025 in proportion to feedwater flow. Dose into the feedtank or feed line via a positive displacement pump.